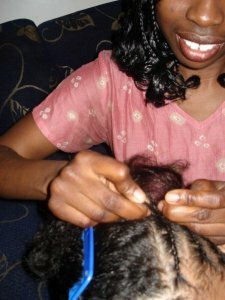 Cornrows or canerows (or track braids) is a traditional African braiding technique. Cornrows are made by braiding the hair onto the scalp’s surface, after parting the hair into a design. Part a section of the hair starting from the hairline to the nape, keeping in mind that the thicker the section the thicker your cornrow will be. 2. Clip the rest of the head of hair to the side or put it in a ponytail holder to keep it out of the way while you cornrow the parted section. 3. Starting at the hairline, take a small piece of the parted section and split that piece into three equal strands. TIP: Anchor the right strand of hair in-between the middle finger and ring finger of your right hand; and anchor the left strand of hair in-between the middle finger and ring finger of your left hand, and brace your hands against the head, leaving your thumbs and pointer fingers free to pull the outside strands under the middle strand as you braid. Try to brace your pinky fingers against the head, and hold the strands as upright as possible, to help you get the right tension! 4. Start braiding the strands like a regular plait using the underhand method (opposite of a French braid) for about two stitches/notches: using the pointer/index finger and thumb of your left hand to pull the right strand under the middle strand; using the pointer/index finger and thumb of your right hand to pull the left strand under the middle strand; the right strand under the middle strand, and the left strand under the middle strand. 5. Now you will start the cornrow. As you make the motion of pulling the right strand under the middle strand using the pointer/index finger and thumb of your left hand, pick up extra hair from the right side of the parted section and pull it into the right strand. Pull the right strand with added hair under the middle strand. 6. Then, do the same thing as you make the motion of pulling the left strand under the middle strand using the pointer/index finger and thumb of your right hand, pick up extra hair from the left side of the parted section into the left strand. Pull the left strand with added hair under the middle strand. TIP: As you pull the right and left strands under the middle strand, run your fingers through to the ends to prevent the free ends from tangling. 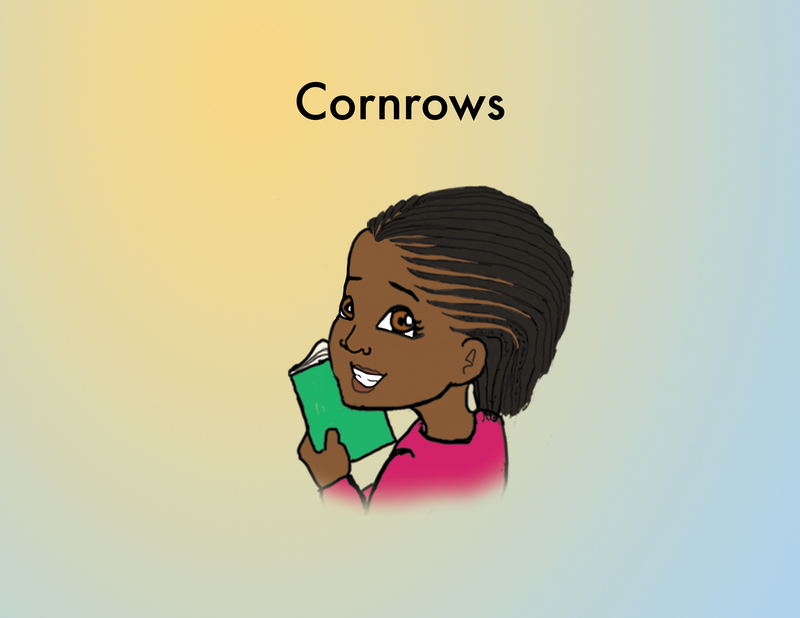 TIP: As you cornrow, try to keep your hands at an angle of as close to 90 degrees as possible/upright against the head (as opposed to following the direction in which you are cornrowing). Holding your hands at close to 90 degrees/upright will help you get the right tension to keep the cornrow neat and tight (without yanking the hair). 7. Continue to cornrow, by repeating Steps 5 and 6: picking up extra hair on each side as you pull the right strand under the middle strand, the left strand under the middle strand, the right strand…until there is no more hair to add from the parted section. TIP: Try to pick up the same amount of hair on each side to make the stitches/notches of your cornrow neat and even. 8. Once all of the hair in the parted section is cornrowed against the scalp, continue to braid the free ends like a regular plait using the underhand method. 9. Once you get to the end of the plait, if the hair is very curly, the cornrow may hold itself together. If not, you can either spiral the ends around your finger, using a little twisting gel/cream, or you can secure the cornrow with a snag-free/covered elastic band, clip, or barrette. 10. Unclip or loosen the unbraided hair and repeat Steps 1-9 until the entire head is cornrowed. TIP: How you part the hair will determine the size and shape/design of your cornrows; so, to keep them even, in Step 1, part the new section the same size and in the same shape as the cornrow beside it. Also, keep in mind, if you are cornrowing straight back, as you part the hair, you will have to taper the section toward the nape—the hairline and the crown of the head covers more area than the nape, so if you don’t taper the sections, you will run out of hair to cornrow at the back of the head. Finally, to keep your cornrows neat, wear a satin/silk scarf or headtie, or use a satin/silk pillowcase when you go to sleep. Depending on how curly your hair is, how small the cornrows are, and whether you tie your hair at nighttime, your cornrowed style could last for a few days or up to a week or so. No problem! Please let me know how it goes!